Levithan, David. (2005). Boy Meets Boy. Alfred Knopf. I loved this tender and funny story about Paul, a 15-year-old boy negotiating his way through his first serious romance. It’s beautifully written and extremely realistic in its emotional portrayal of the internal angst of first love. The audio production I listened to (from Full Cast Audio) was wonderful. So I’d recommend it on those values alone. But what I particularly enjoyed was that it focused on the story of LGBT characters who were safely and comfortably “out” to all. Paul is a gay teen who has grown up in a accepting family, a welcoming school, and an accepting town. Paul courts his love openly at school, in the full light of (mostly friendly) high-school gossip. The high school bookie runs odds on his relationship success (at one point 12-1 against.) And on a date to the local park, they kiss in a paddle boat, resulting in (wait for it) … a friendly wink from the operator when they return their rental. Paul also has a wide circle of friends, male, female, trans, gay, straight, and uncertain, some of whose families and communities are not as accepting of them as Paul’s. Many of them think Paul has it “easy”. But being in love for the first time isn’t necessarily easy. Even at a school where the star quarterback is a drag queen who goes by the name “Infinite Darlene”, Paul still has to deal with his own and others’ confusion about who is attracted to whom; the effects of school gossip; and the variable level of helpfulness of various friends eager to give advice. Wow, just like his (straight) friend Joanie and her new boyfriend! Although some of Paul’s friends think he is “lucky,” he thinks they are “unlucky”. This book might be called a fantasy because it couldn’t happen here … so far. But how wonderful it will be when Paul’s view is the norm, and lesbian, gay, bisexual, transgender, and questioning teens need contend only with the normal storms of adolescence–without a heavy heap of discrimination on top. Now, I work with LGBT teens and their families in my practice, and because we don’t live in Paul’s world … yet … here are some links if you’re an LGBT-identified teen, or the family member or friend of one, and want some help. The Trevor Project has a toll-free Lifeline (1-866-488-7386) and Chat Service for LGBT, queer, and questioning teens and young adults. The It Gets Better Project is a set of many videos by people who want you to know that you can get through adolescence, even if your school is not at all like Paul’s. If you like Paul’ story, you’ll probably enjoy Glee. Parents and Friends of Lesbians and Gays is an organization that provides support to families and friends of LGBT and questioning folks. Gender Spectrum is a non-profit organization supporting transgender children, teens, and their families. Also, here’s a brief overview article about transgender children and their parents, from Psychology Today. Here’s an for parents about supporting LGBT kids, from Kids Health. Johnson, Steven. (2006). 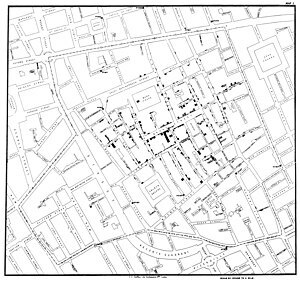 The ghost map: The story of London’s most terrifying epidemic–and how it changed science, cities, and the modern world. Riverhead. This readable, although occasionally repetitive, book describes the epidemiology used to track the source of cholera in 1854 London. The science of epidemiology was new, and the techniques the researchers used were new, too. In fact, using these new techniques, the people involved manage to trace the transmission of a bacterial illness before bacteria themselves were known to science. Ghost Map is well worth reading. Johnson intersperses background information—-such as the evolution of bacterial illnesses and the structure of 1850s London–with the story of how Dr. John Snow and Rev. Henry Whitehead found the source of the 1854 Broad Street epidemic. In describing these events, Johnson also uses well-chosen quotations from a wide range of Victorian sources, including medical journals, newspapers, and fiction. Snow and Whitehead’s research eventually led to the development of the modern sewer system in London. I particularly noted Johnson’s account of how, when Snow and Whitehead published their findings, the medical establishment ridiculed them because they contradicted the prevailing “wisdom” about disease transmission. It reminded me of current events in both medicine and politics in which correlation is equated with causation or where people ignore current research because it doesn’t match their theory. Johnson’s analysis of this problem looks at many factors, such as the use of human senses in survival, the application of the scientific method, and the influence of published information on public opinion. Understanding this issue may help us to sort panic from science around current issues such as global warming, the “obesity epidemic”, and potential modern “plagues” such as bird flu. Indeed, in the last few chapters, Johnson looks at the current issues of disease transmission, urban structure, and the possibility of modern epidemics. Unfortunately, despite the timeliness of this topic, I found this to be the most repetitive and least interesting section. Overall, Johnson’s integration of information from so many varied sources makes Ghost Map an interesting look at an important part of scientific history that supplies useful insight into current issues. P.S. For a humorous look at correlation vs. causation, see cartoon in Bloomberg Business Week. Review: A kid’s book that’s not for kids? Yesterday, while searching for a book to use to educate children and teens about mental illness, I encountered the book Sometimes My Mommy Gets Angry, by Bebe Moore Campbell, illustrated by E.B. Lewis. It’s a beautifully written and illustrated book about the experiences of a little girl as she deals with her mother’s widely varying moods. The mother’s illness is never specified, but is likely bipolar disorder. What I liked about this book is the very real sense of the child’s experience of not knowing, when she goes home, which kind of mom she’ll have: an excited, loving mom, or an angry, emotionally abusive mom. What I disliked is the fact that the neighbors and grandmother had just accepted the situation. They provided emotional support to the girl, but there was no evidence in the book that they were trying to do anything involving confronting the mom about the effect her illness had on her daughter or helping her get treatment. On the one hand, this book reinforces the resilience of kids who are really in a situation like this. Hope. On the other hand, it suggests that’s all there is to do. Hopeless. This mixed-up message really bugged me. If I were doing therapy with a family in which a parent is affected by a severe mood disorder, I’d be more likely to use this book with a parent, to reinforce a suggestion that parents should get help for the sake of the child—even if they won’t do it for themselves. But frankly, I’d be reluctant to use this book with a child unless I could also discuss some other alternatives for dealing with the situation. In her Author’s Note, Ms. Campbell does discuss alternatives. She notes that she hopes that this book will reinforce coping strategies, and she also encourage the village that supports the child in such a situation to take action. So I think this book is really a book for grownups, even though it’s a picture book. If you know a child who truly needs this book, please go to the website of the National Association for the Mentally Ill (NAMI) and look at what you, as a parent, extended family member, or family friend, might be able to do to help, including encouraging the ill parent to get treatment. When I find books that I do think work well for children, I’ll write about those too.